The world is watching with bated breath as divers attempt to rescue a group of boys and their soccer coach who have been trapped for over two weeks inside a flooded cave in Thailand. Several hours ago, it was reported that four of the 12 boys have been saved. Divers continue to race against time in light of weather forecasts anticipating the arrival of heavy monsoon rains, which will severely complicate the rescue. After news broke worldwide about the quandary on how to safely and efficiently extricate the trapped individuals, SpaceX CEO Elon Musk announced that his team of engineers was planning to send a specially designed, child-size submarine to aid the operations. 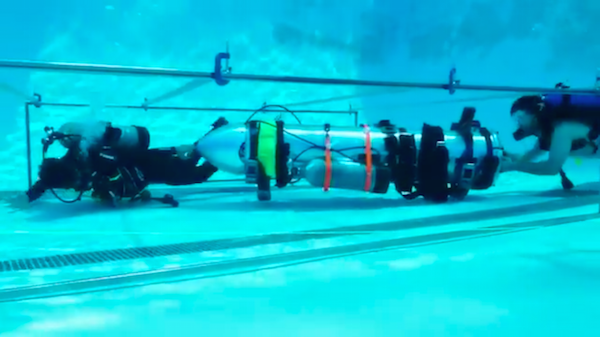 Mere hours ago, Musk shared photos and videos via Twitter that reveal what this mini submarine looks like. The vessel was put to a test using a swimming pool located at a high school facility. The submarine could safely transport the children through narrow passageways that might otherwise cause them to panic underwater, since some of them do not know how to swim, let alone dive in confined spaces. CNN is currently providing live updates on the rescue operations. Pretty close. There is a nosecone on the front to protect against rocks impacting fwd air hoses with a hole on the side for hoses to exit.